We Indians are obssessed with sarees this can be said owing to the fact that no matter what region of the country you go to, you can find women wearing sarees in one form or the other. Each culture, each state has its own variant to this beautiful attire. Each one of the variants has its own beauty and grace. The cloth types vary, the designs vary. 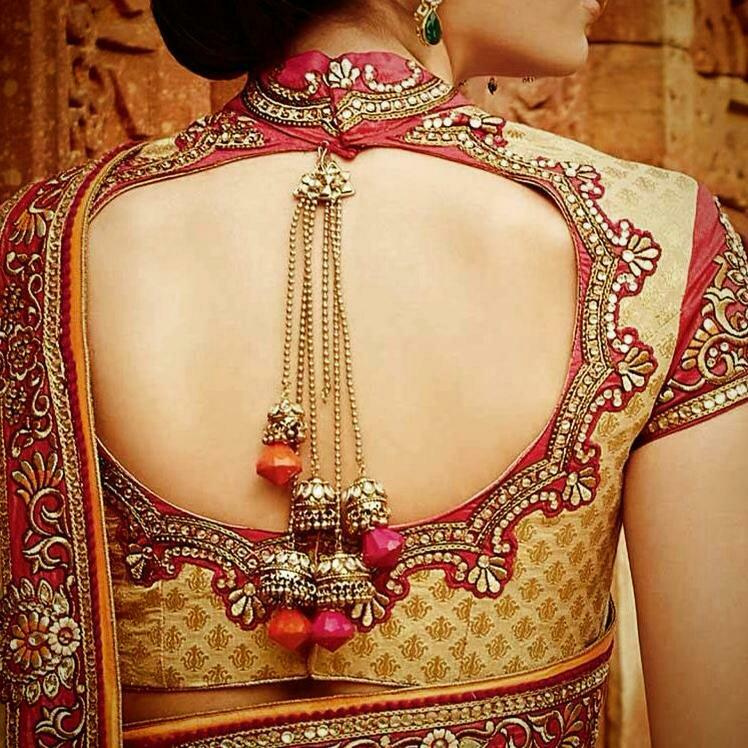 People go to great lengths to achieve the perfect designer sarees according to day and occassion. 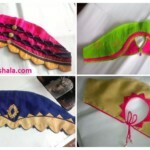 Designing the blouses is an integral part of beautifying the sarees. 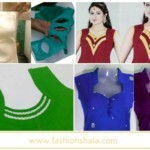 Designers have been taking great pains to achieve beautiful blouse designs. 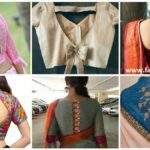 One part to blouse designing is the back of the blouse. 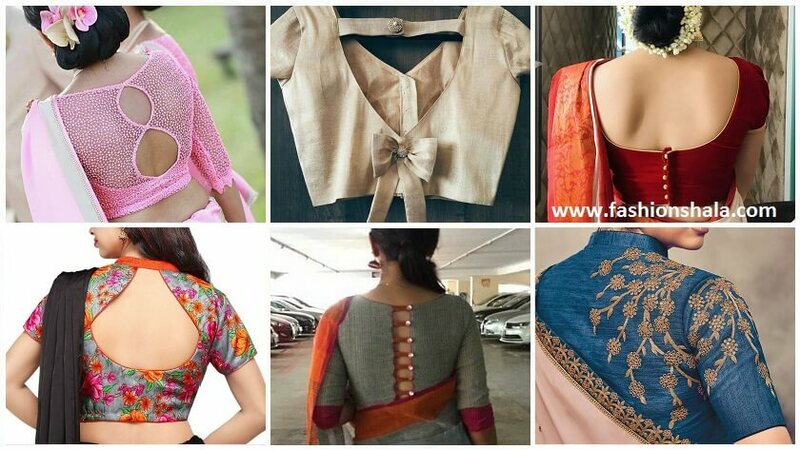 You can flaunt your skin with beautiful back designs for blouses. We present to you the best of these. With this design you get a high neck on the front part and half sleeves. 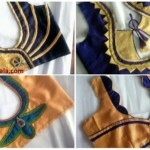 The back cut of the blouse is ornated with beautiful latkan. T somewhat circular cut helps to keep your posture and body design in mind. This beautifull enhances your attire and at the same time giving you a quirky edge over others in terms of dressing up. Get your blouse this beautiful cut design to be the talk of the town. 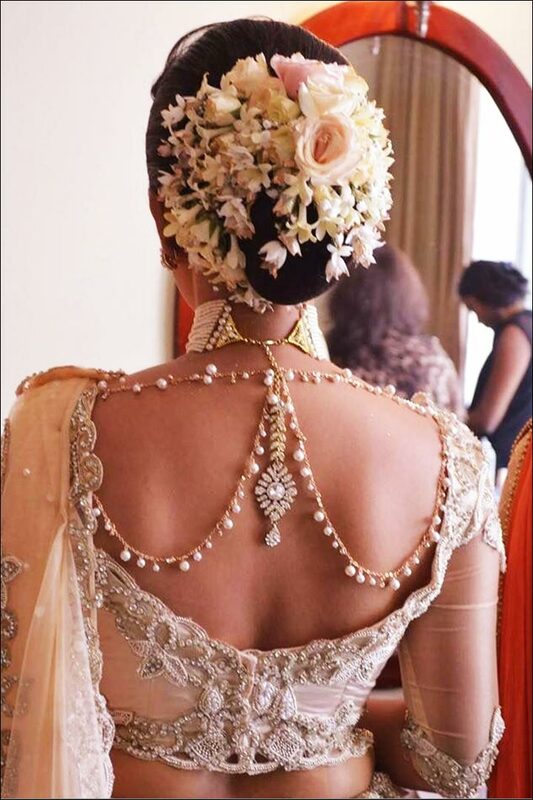 This is a sweet and simple back design without much skin show. You can easily carry this on weddings and parties. Be sure to get your back cleansed beagore you wear this. This is a simple design with latkan ornamentation on the ends of the dori as well as on the sleeves. You can add more elements to it if you wish. 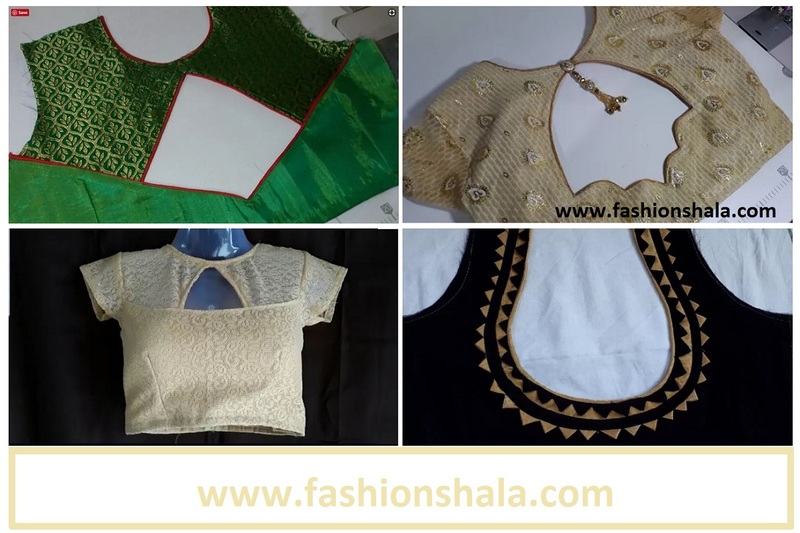 You can decide the depth of the front neck design as per your wish in this designer blouse. It looks sweet on girls as well as young ladies. In this designer piece you get a deep back cut. The cut is covered with strings of holden pearls. This ornate blouse design has full sleeves to ensure strength of the blouse. The beautiful strings of pearls ensure that the beauty of this designer blouse is enhanced. You can teem this design with sheer and semi-sheer blouses. 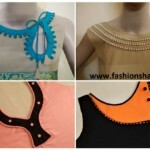 You can teem up strings of pearls as jewellery for this blouse. 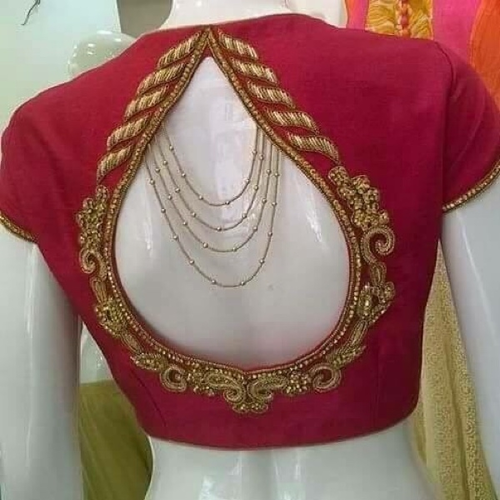 You can also make a choli for your lehangaa with this design. This is a simple yet beautiful girlish design for parties and birthdays. The tear drop cut adds definition to your body structure. It will look very good on slender girls. 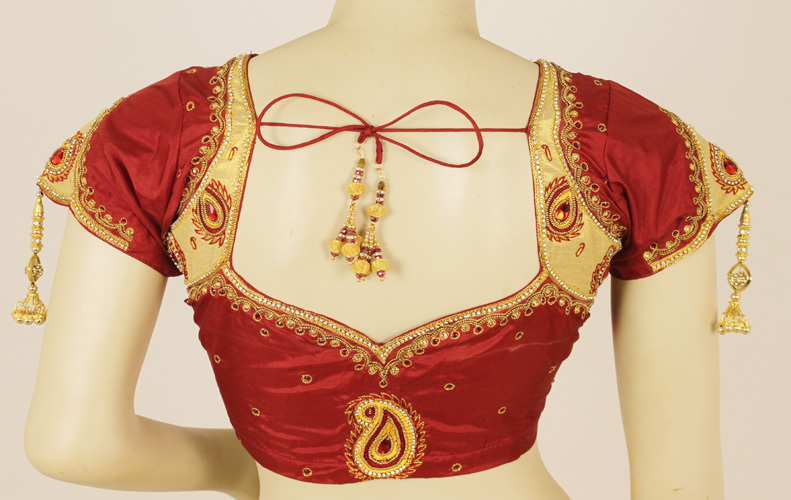 The strings in the middle of the cut add more beauty to this beautiful maroon design. You can surely get this design for any of your blouses. 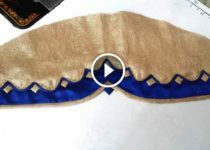 If is recommended to get the outlines defined around the tear drop cut using embroiderg work or sequins. It will pop the cut and add more beauty to your attire. You can also choose rhinestones to go with this design. 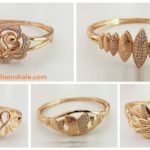 It is a very go to design for parties, weddings, mehandi functions, cocktail parties etc. If you are not comfortable with skin show, you can easily carry this beautiful designer back with ease. 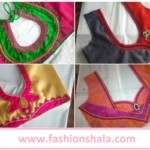 This design comes with parallel embroidered panels and you can choose zip as the closing option for your blouse. Adding loops for superficial buttons will define it further. 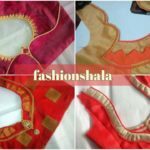 You can buy an embroidered cloth for this blouse design or get the embroidery done after the blouse gets stitched. 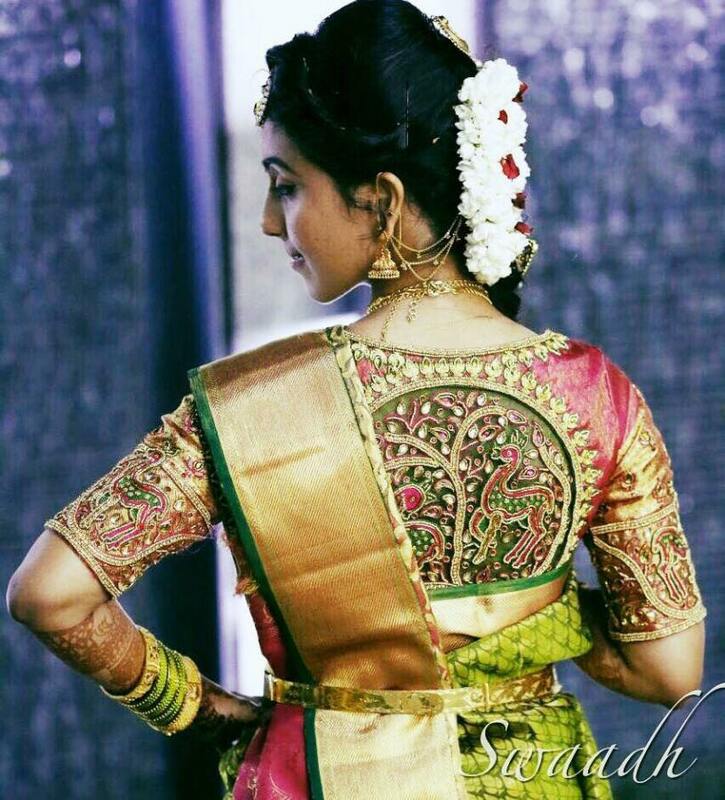 This designer blouse will surely perk up your saree game. This white blouse is beautifully decorated with flowery embroidery and latkan. The strings of pearls have been beautifully placed. The strings define the toned back. 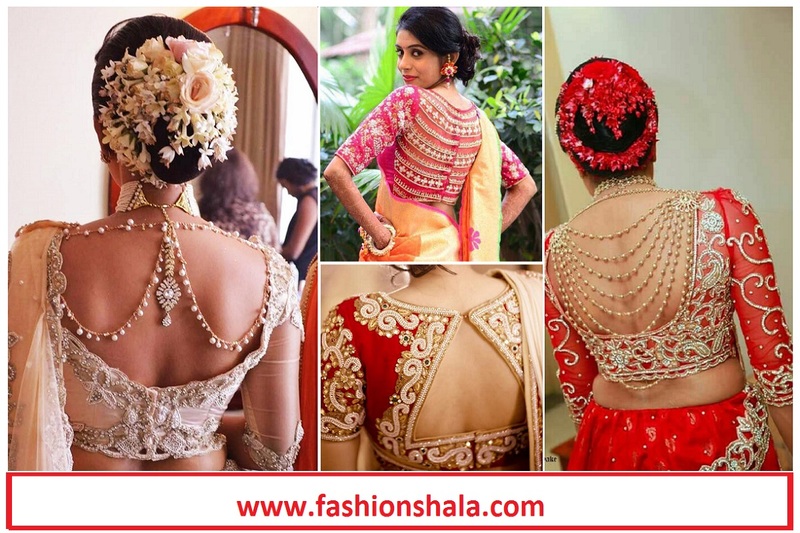 Such blouse designs are appropriate for the bride to be or the sisters of the bride and groom. Such pieces are a beauty itself. It can be beautifully teemed up with a saree or a lehangaa. This blouse design defines you as beautiful, elegant and courteous lady. You can easily teem up a neck choker with this kind of a blouse. 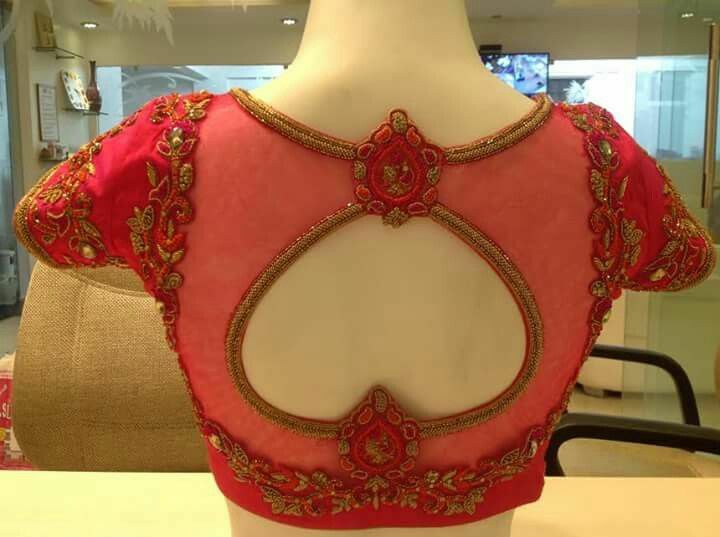 This is a beautiful blouse back design. It is very much suitable for newlyweds and parties. You can teem it up easily with a lehangaa too. You can get the cut at the back adjusted according to your own needs and preferences. The dori will help you to keep the blouse in place. You can add latkan to the dori, this will surely add beauty to it. You can add sequins to the outline of the cut. You can add sequins or beads to the sleeves of the blouse. This will add coherence to this piece of clothing. This can be beautifully used with sarees and lehangaas alike. This simple yet elegant blouse design is a sure shot winner. This defines your arched back. Embroidery goes very well with this designer piece. You can use embroidery patches and embroidered laces with this design. You can keep the front neck deep while keeping the back high. The cut seems like an inverted heart and is sweet enough to be worn by young women and young ladies. You can get the back made in sheer or net. 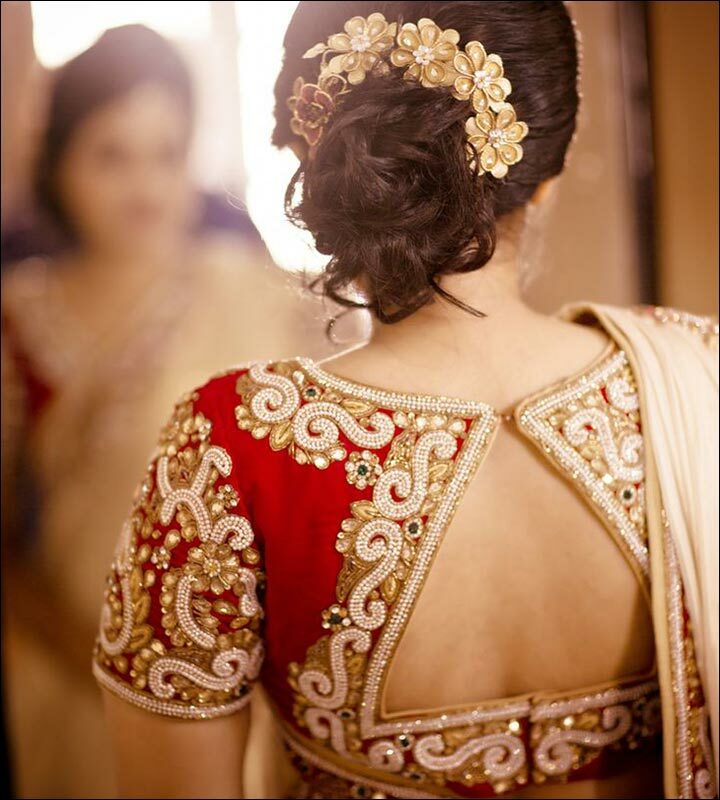 This traditional sweet embroidered portion of the back is impeccably perfect and is so beautiful. Just teem it up with beautiful colours and traditional jewellery. This surely makes a good choice for weddings and ritual ceremonies. Once you get this blouse, it will surely become your go to piece of attire. You can get religious relics or patterns embroidered on the back of the blouse. We hope you like these blouse designs. These all are few of those designs which are a go get fetch for anyone. Flaunt them once you get them and be the talk of the town.